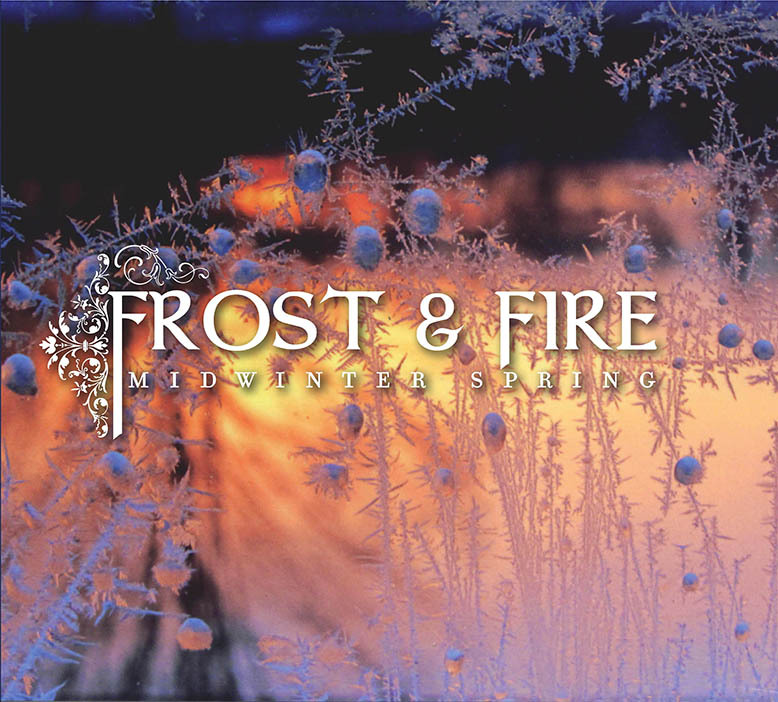 Midwinter Spring is the debut album from Vermont folk quartet Frost and Fire. (c)(p) 2013 Mountain Road Music. All rights reserved. -Gary Apfel, Brian Perkins, Jasmine Walker, Karen & Steve Easter, Peggy Marcus, Peter Edwards, Susie Hurd & Timothy Grannis, and Susie Petrov. -All of the wonderful callers, hard-working dance organizers and enthusiastic dancers who have made our lives so much fun over the last 2 years. -Vermont Public Radio for the use of their recording studio. -Photographer Debora Cherington, whose images of frost were captured through her barn windows at sunrise. –Finally, to Sam Sanders: friend, mentor, fan, poetry lover, wise man, engineer, still point in our turning world. “Thank you” doesn’t begin to cover it. Aaron challenged himself to write a tune with a traditional feel; Anemone was the result. We follow it with tunes from the Cape Breton and Franco-American traditions. Dancers always stomp their feet to this set! Caald Nights and Scalloway Lasses are Shetland tunes Viveka learned as a college student in Boston, and Hollis learned Glen Where The Deer Is from Hamish Moore at bagpipe/swimming camp in Vermont. Stephen Foster wrote dozens of classic American songs (which we strive to emulate) and died penniless because of people pirating his music (which we hope to avoid). Aaron brought this sweet song of remembrance to band practice one afternoon; before we finished playing it the first time, we had all fallen in love with it. Peter wrote Tendrils as a jig, and we transformed it into a reel while playing around one night during sound check. The Snake Mountain Gathering is a mystical event about which Peter says little and thinks much. Hollis wrote this tune to honor Jasmine for choosing to love a musician even when the road trips and instrument cases pile up. She makes his life a lot sweeter. Aaron fell in love with Wyoming and its people while doing botanical field work there after college. We follow it with a tune for the wedding of two friends. Peter’s brother runs an inn in northwest Scotland in the village of Glenuig, and Reigate is a town in Surrey, England. The last tune is a session classic on both sides of the Atlantic. Ever imagined bobbing for heirloom tomatoes instead of apples? Hollis did, and wrote a tune about it. The second tune came to Aaron while pedaling his bicycle toward the village of Adamant in Vermont’s Green Mountains, and the third tune is written for Julia Friend. Robert Burns is Scotland’s most celebrated poet. Hollis learned this song from Susie Petrov, his former teacher and a longtime friend of the band. Love songs with a wistful twist have become a hallmark of Frost and Fire, and this is no exception: a beautiful song of farewell. Hollis wrote Tabitha’s Rambles while watching his kitten, Tabitha, exploring the outdoors for the first time. The second tune came from a challenge to write a spooky tune with autumn winds and dried leaves in its bones. Ravencroft is the Burlington home of Susie Hurd and Timothy Grannis, two of our band’s earliest supporters and favorite friends. They’ve opened their hearts and home to us more times than we can count. For those keeping score at home, this tune is in 10/8 time. We’ve all spent years wishing we could bring our loved ones closer whether mountains or oceans divided us. Aaron penned this beautiful meditation on what draws us together even when we’re far apart. Aaron celebrated the wedding of two friends with this sweet march. Peter found intriguing tracks in the snow one winter and wrote this tune for the elusive bobcat. It took a few years before he finally caught a glimpse of the bobcat strutting its stuff. Nuptial Knot is an 18th-century Scottish fiddle tune that Viveka and Hollis have loved for years. We give it the full Frost and Fire treatment and follow it with a brand new reel that Viveka wrote to keep the dancers warm all winter long. This track doesn’t appear on the album, but we managed to catch it as an out-take during a long recording session when the main recording program we used, Capture, kept glitching and losing great tracks. After a while this became pretty frustrating—we’d play for five minutes, then look into the control room and see Sam shaking his head saying that Capture had glitched again. We couldn’t wait to get our tracks into Sony Vegas and leave Capture behind. Well, don’t get mad, get musical! Hollis started improvising a lyric that drew from Broadway show tunes, blues, James Taylor, etc., and everyone joined in. We have fun playing together, and we thought we’d share it with you. See how many subtle jokes you can spot in the lyrics!